Magnify the joy of your Rasta Cafe visit with lots of adventure activities like rappelling, multivine traverse, zipline, Burma Bridge, ladder walk, wall climbing, rocket ejector and kayaking. 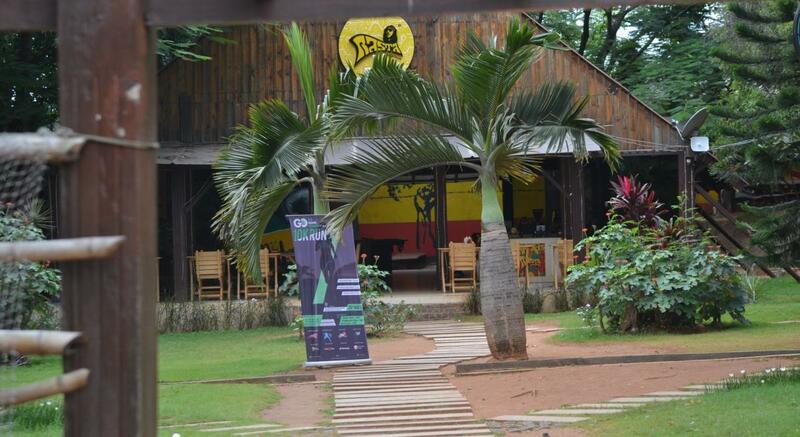 In a lazy morning while you, with your friends, are roaming around the vicinity of Rasta Cafe, there lie hours of boredom with no fun stuffs to add for the rest of your day. Right at this moment, Escape2Explore hops in as a savior for all of you, offering the delightful day of adventures. You and your friends join the magical moments of adventure activities after the tasty breakfast & tea. The safety jacket with the support of a rope will always on during any of the rope activities. Rappeling: You will get down from a small peak or specially created wall with the help of a rope tied to your hip. MultiVine Traverse: Walk on a single tight rope with the help of a few ropes that hang vertically. Zipline: Slide on a thick rope from one tree to another tree with the help of a pulley. Burma Bridge: Walk on a single rope tied by multiple ropes that would look like a bridge as a whole. Ladder Walk: Move step by step upwards towards the top of the tree on a single rope and once reached you will fall in a comfortable spongy surface. Wall Climbing: Touch the highest point by climbing on wall with the help of many grippers. Rocket Ejector: Rocket Ejector adventure is a rope system in which a person is hinged between the two towers through a rope and a safety jacket. The ejector then launches the person into the air at a height of 30 to 40 ft, where one gets some seconds to perform their acrobatic moves like flip and roll. Kayaking: Grab your kayak boat and paddle to enjoy the ride on the water and if you like to, you can engage yourself in the water fun. In between these activities, you can grab your delicious lunch. Once all the activities are covered, you can chit chat and crack jokes among friends while having light evening snacks & tea. A minimum of 4 people are required to have registered for a single day.